I am one of those people who likes to go big or go home. I have a major competitive streak - but not that constant comparing myself to other people type. I love streamlining and finding better processes to make things run smoothly but also, I just really like doing things well and to the best of my ability. I compete with myself. Always trying to outdo what I did the last time. With that little bit of crazy though, I also tend to over do things, but I definitely come by it honestly. It is a Jameson thing. Shout out, Dad! For our Valentines shoot I had another moment. Making things more complicated and over doing it! I reached out to four moms and their girls to be our models for the afternoon! After they confirmed that they could have some fun with us I took it to another level. I reached out to the dads! 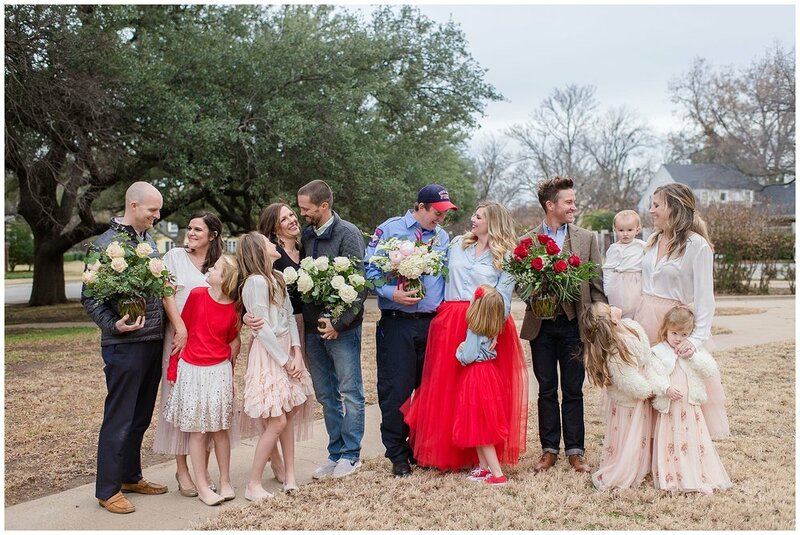 We came up with a grand scheme to surprise the girls family by family with dad, cookies or chocolates and a Classic Dozen Roses for mom. I am a planner by heart and a over-complicator by nature. However, The results were priceless and so worth it! Andrew Bell - You are one lucky man! What beautiful girls!! They trusted me a whole lot… and I still let Rachel trip! So sorry Rach! Who doesn’t love the Archer’s? They are so sweet and genuine!! Poor Annie was having a rough day! Ear Ache’s and the cold… but seeing dad makes it all better! Daddy’s little girl forever! - Thank you Blair’s! One of my favorites! I am partial though - they are family! My fav little strawberry and her parents! We LOVE our firefighters. We have a lot up our sleeves for them in the upcoming month. Stay tuned. Flowers for mom, but I think we know who actually has him tied around her finger! I do have a favorite WFFF! Tony Smith! One of the best big brothers a girl could have (well, Brother in law) One of the hardest workers you will ever meet! P.S. Check out SeasonMaster on Facebook an give them a like! So that’s a wrap. Worth it right? Thank you to all the dads who helped pull off this awesome surprise, Julia M. Photography, Kayla Moser Makeup the Jameson’s Team, Fresh Batch Cookies, and B. Cocoa Artisan Chocolates! Remember - Pre-order by 1/15 and you, the sender, will receive a free G&R Premium Cigar and half a dozen chocolate chip cookies from Fresh Batch!